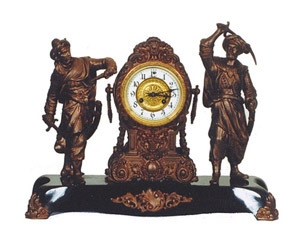 Waterbury Clock Co. figural clock, "Viking", ca 1905. Enameled iron base. Statues, tower, and ornaments are Japanese Bronze and the original finish is excellent. Case is 15 inches high and 19 inches wide. Movement is 8 day, half hour gong strike, and runs. 4 1/2 inch ivory dial ring is perfect, fancy gilt center. Has correct hands and pendulum. Nice gilt sash, bezel, and beveled glass. Ly-Waterbury No.505.